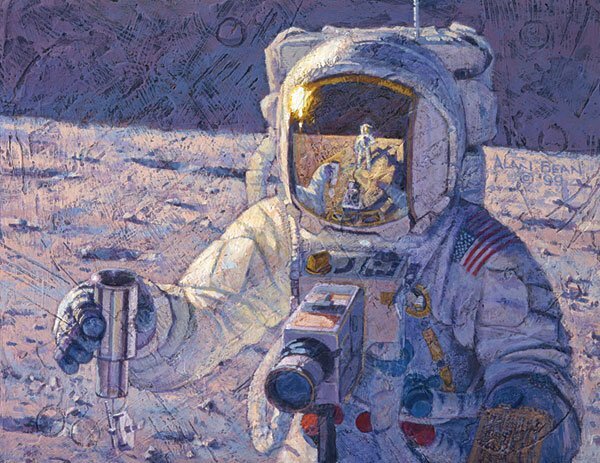 Image size: 18"w x 14"h.
"The scientists on earth were concerned that the lunar samples we would be collecting on the Apollo missions could be tainted by our spacesuit gloves as we picked them up and stored them. They devised a small metal Environmental Sample Container (ESC) and asked us to put small rocks and dirt in it using only our shovel. This allowed us to insure we never contacted that sample with our gloves and that it remained stored in the lunar environment, in pristine condition, until we got home. "Pete had practiced placing dirt and small rocks in The Environmental Sample Container on Earth with the small shovel, while I held it steady. It was a quick and easy task. "Of course, once we were on the lunar surface, in the reduced gravity, the whole exercise got far more complicated and fun. Pete had no problem picking up some loose dirt and rocks. As he swung the end of the shovel towards me all went well. But as he slowed the shovel down to carefully place the sample in the Container, the dirt did not slow down. It just seemed to float out of the shovel and slowly fly all over the place, me included. It was fun to watch objects, including dirt, move so slowly in one sixth gravity and we were laughing at the mishap. "Pete moved the shovel, with dirt and rocks, much more slowly on his next attempt and he deposited it in the sample container you see in my right glove. I then carefully put on the lid you see dangling below. It was lined with indium, a malleable and easily fusible metal, so when I screwed on the cap it made a perfect seal. "When the scientist back on earth compared these samples with the ones we collected with our gloves they, and we, were elated. There was no difference."